“My body doesn’t work the same as it used to,” says Kriss Akabusi begrudgingly. “I play a lot of golf and do some stretching and mobility, but sport has lost its impetus for me now. Such powerful words are not that surprising from a man whose outstanding performances are widely recognised to be fuelled as much by his steely competitive streak as his equally incredible athletics talent. The man who broke David Hemery’s 22-year-old 400m hurdles record with his 47.82 European-winning time in Split in 1990 also won world and Olympic bronze, but will probably always be remembered most for helping Britain clinch gold and beat the Americans in the 4x400m relay at the 1991 World Championships in Tokyo. Despite his admittance that “nothing in life compares to the buzz of being an athlete”, Akabusi enjoys golf and uses it as a way to keep in touch with his former GB athlete team-mates including Roger Black, Derek Redmond, John Regis and Brian Whittle. “Unfortunately we lost Todd Bennett. We have retained a certain bond from athletics. We were competitors, but best buddies. Golf is now a unifying factor among us,” explains Akabusi, pictured above at the Barcelona 1992 Olympics with 4x400m team mates Regis, David Grindley and Black. Akabusi also plays golf for the Sports People Aiding Medical Research for Kids (SPARKS) children’s charity, which is something close to his heart. Speaking to Akabusi, who was made an MBE in 1992 for his services to the country through athletics, it is clear that the 55-year-old misses aspects of his heyday. “I love my life, but I miss my time as an athlete in terms of professional fulﬁlment. It is a selﬁsh existence. You have to retain that focus on who you are and what matters most. The world conforms around you and you are effectively the centre of the universe. 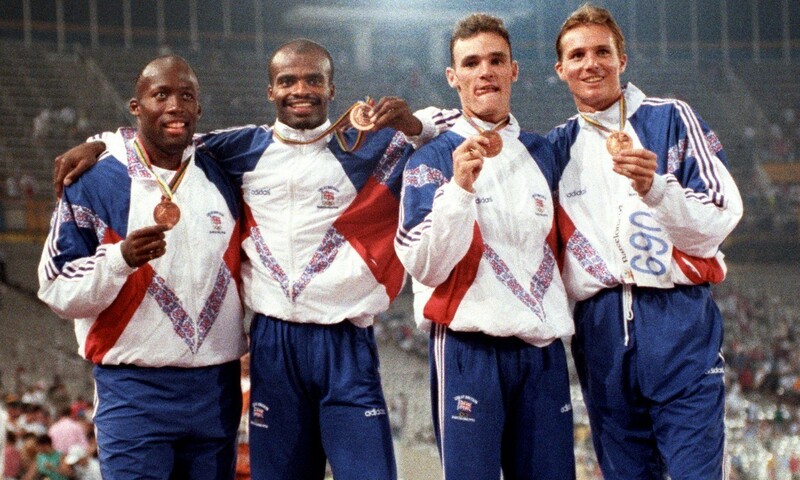 Athletics teaches you to live your old life,” reveals Akabusi. Fast forward 20 years and Akabusi shows no signs of slowing down. “There is no such thing as a typical day. The last thing I do at night is go out and walk the dogs and get some fresh air. I go to bed about midnight and get up again about 4am and read,” he says. After a light breakfast of porridge or a bagel with something sweet, he picks up his son and drops him off at school before heading to his office for some administration work. “I have my own company, The Akabusi Company, so I go off to conferences in Birmingham or London a couple of times a week and speak about peak performance,” he says. With four people supporting him in delivering a programme aiming to transfer messages from conference executives to delegates in a more light-hearted manner, he is also trying to have a positive influence on the next generation and it is clear that helping others is something that he feels truly passionate about. “I lead workshops for young adults and try and inspire them to get housing and jobs through ‘Project Mackenzie’. This is something I am really excited about,” he reveals. The project’s name originates from Sgt Ian Mackenzie, who Akabusi met in the army and was his first athletics mentor. Akabusi also feels his time in the military has impacted upon his general life. “Both my life as a soldier and athlete have instilled discipline in me and contributed to my development. There are always new things to learn,” he explains. As well as his company’s work and founding the Akabusi Charitable Trust, which helps young people in impoverished communities, Akabusi is studying for an MBA in Business Administration at Ashridge Business College. This involves assignments and meeting up once a month. Akabusi has also enjoyed a number of television appearances. Post-athletics, he worked on Record Breakers, The Big Breakfast, and appeared on many quiz shows such as A Question of Sport, They Think It’s All Over and Through the Keyhole . He even appeared as a milkman on Last of the Summer Wine in 1997. He still regularly goes on Sky Sports at 6 am or enjoys an evening slot on League of their Own , which has revitalised his TV career in recent years. Akabusi is clear what he likes about what he does. “I like being in charge of my own day and working hard. I engage with the customer and do what they want. Everything I do is because I enjoy it,” he says, with that same ever-present smile wide across his face.